and thank you for visiting our website. 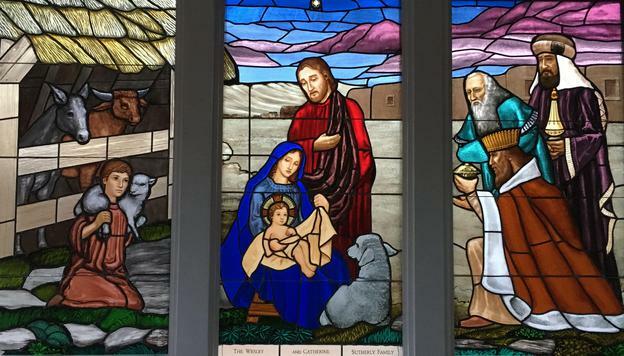 Founded in Southeastern Wisconsin, Blanck Studio of Art is a national firm specializing in stained glass creation and restoration along with liturgical and historical applied arts. for professional excellence through the high quality of services we perform for our clients. Restoration of (29) stained glass windows with new protective storm glazing. New paint scheme in the Sanctuary & Transept as the primary of a two-part restoration initiative. New paint scheme unites marbling and ornate stenciling with trompe l'oeil framing and enhancement of existing artwork. Restore exterior Statue of Mary. Design, fabricate and install (5) new stained glass windows. New paint scheme integrates the vertical center nave with ornate frieze stenciling and faux wood-grained ceiling beams, and includes faux marbled columns, trompe l'oeil finishes, and gold leaf gilding throughout.